Known as a member of highly-heralded, boundary pushing electronic act Sandwell District and the head of underground electronic music label Jealous God, Juan Mendez is an renowned Los Angeles-based electronic music producer, DJ and art director, known for aggressively pushing techno’s sound and aesthetic forward at least twice in his career, with his solo recording project Silent Servant; in fact, Mendez’s solo debut Negative Fascination is largely considered a game-changing modern classic. Mendez’s sophomore Silent Servant soon-to-be released effort Shadows of Death and Desire reportedly finds Mendez’s song evolving towards a much more raw, abrasive and aggressive sound. In fact, album single “Damage” walked a tightrope between the chilly atmospherics of John Carpenter soundtracks and the tense, harrowing, industrial clang and clatter of Blanck Mass, as the track is centered around layers of arpeggiated synths and thumping beats, but while being dance floor friendly. Perhaps best known as a member of heralded electronic act Sandwell District and the head of underground electronic music label Jealous God, Juan Mendez is an renowned Los Angeles-based electronic music producer, DJ and art director, known for aggressively pushing techno’s sound and aesthetic forward at least twice in his career, with his solo recording project Silent Servant; in fact, Mendez’s solo debut Negative Fascination is largely considered a game-changing modern classic. Slated for a December 7, 2018 release through Hospital Productions, Mendez’s Silent Servant forthcoming sophomore effort Shadows of Death and Desire reportedly finds Mendez’s sound evolving towards a much more raw, aggressive and abrasive sound; in fact, album single “Damage” walks a careful tightrope between the chilly atmospherics of John Carpenter soundtracks and the tense, harrowing, industrial clang and clatter of Blanck Mass, as the track is centered around layers of arpeggiated synths and thumping beats, but while being dance floor friendly. Perhaps best known as a designer and creative director of footwear and accessory company Ivy Kirzhener New York, Vero Faye’s footwear line can claim a long list of celebrity clientele including Beyonce, Jennifer Lopez, Shakira, Kesha, Lily Collins, Cassie, Jamie Chung and Tori Kelly. 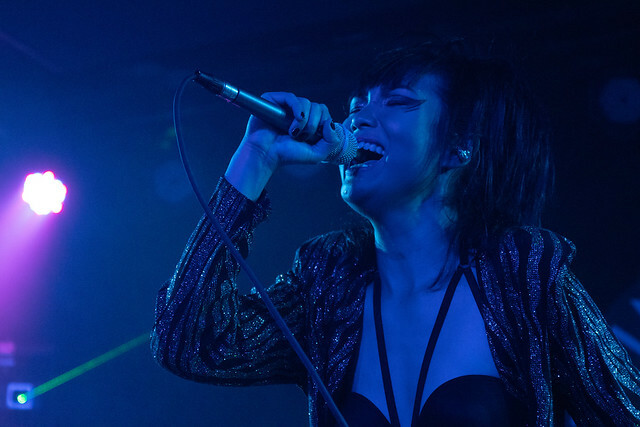 And interestingly, as Faye was developing her career as a renowned designer and creative director, she also has a stint as the frontwoman of local metal band AIKOSTAR; however, with her solo recording project CZARINA, Faye has reinvented herself as she’s been crafting synth-based music. In fact, Faye’s latest CZARINA single “Blaze” is a brooding yet swooning pop track centered around arpeggiated synths and thumping beats manages to sound as though it draws from John Carpenter soundtracks but with a rousingly anthemic hook that gives the song an unexpected radio friendliness. Child of Night is a rather mysterious Columbus, OH-based post-punk act and over the course of two EPs — last year’s Breathless EP and Neither of These Alone Is Enough, the members of the band have quickly developed a reputation for crafting murky, lo-fi synth based post punk that sounds as though it were inspired by Joy Division, Interpol, The Cure and others. What Remains, Child of Night’s forthcoming EP is slated for a late August release through Altarpiece Records and the EP’s latest single “Sirens” continues on a similar vein as their previously released material — murky, synth based post punk with decidedly goth leanings; however, there’s a subtle refinement of their sound, as there’s a focus on crafting a steady, dance floor friendly groove centered around a propulsive bass line, and four-on-the-floor drumming. It’s as though Antics-era Interpol somehow went a smidge disco and a smudge in the direction of John Carpenter soundtracks. The recently released video for “Sirens” fittingly looks as though it were filmed on grainy and completely fucked up VHS tape, which in some way evokes lingering ghosts and menacing presences just out of the frame. Best known for stints as a member of post-punk acts DTHWBBA and White Fawn, the Halls Head, Western Australia-based singer/songwriter and producer Greg Weir has gone solo with his latest recording project UIU. Detonic Recordings commissioned Weir to provide two singles — “Wild and Innocent” and “Like A Doll” as the fourth single in their Minimal Viable Product series, a monthly release featuring up-and-coming artists releasing A side and B side singles. At the end of the year, the entire series will be released as a comprehensive compilation. Interestingly, Weir is the first Australian to take part in the series so far — and that shouldn’t be surprising, as Weir’s UIU finds him drawing influence from the likes of Futurisk, Suicide, Gary Numan, The Human League and others; in fact, the A side single “The Wild and Innocent” is centered around industrial-like drum programming, droning synths, a motorik groove, a trippy yet ethereal sense of melodicism and John Carpenter soundtrack-like cinematic bent. Adding to the overall dark and murky vibes created by the sounds, the song thematically tells a tale of murder, loss and hopelessness from a woman’s perspective — but filtered through a murky, Blade Runner-esque lens. Patrick Holbrook is a Chicago, IL-based electronic music producer and artist, and his darkwave, synth-based solo recording project Well Yells has received attention both locally and regionally for a spectral sound paired with surreal, dream-like lyrics that draws from much of the music he had admired and learned to play bass following along to — in particular, Joy Division and Bauhaus, and the fragments of music he could remember from his dreams. Although unsurprisingly, his work has been compared to The Cure, Depeche Mode, John Carpenter, The Legendary Pink Dots, and Clan of Xymox among others. Holbrook’s latest Wells Yell album Skunk was released earlier this year, and the album’s latest single “Near” is a brooding and cinematic track centered around layers of wobbling and arpeggiated synths, submerged vocals fed through layers of effects pedals, shimmering guitar chords and subtle, industrial clang and clatter. Sonically, the song manages to evoke a slowly unfurling and inescapable, existential dread. Last month, I wrote about the Jyväskylä, Finland-born and-based, up-and-coming Finnish electronic music producer and artist Ere Ek, who started the 80s cyberpunk soundtrack-inspired project NightStop back in 2012. Since then, Ek has seen a growing profile across Europe and Russia’s tight-knit DIY scene, steadily touring and releasing both cassette and vinyl releases. Now, the Chicago, IL-based label No Trend Records, the label home of Ganser, Absolutely Not and others will be releasing a vinyl edition of NightStop’s most recent effort, Dancing Killer on March 30, 2018 — and as you may recall, although the album has already seen a digital release, Ek included a pulsating John Carpenter meets Umberto-like single “Phantasmagoria,” as a bonus digital track for the album. Interestingly, while that track cemented his reputation for crafting brooding and cinematic retro-futuristic electro pop; however, it may arguably be one of the most dance floor friendly tracks he’s released to date. Building upon the buzz surrounding the vinyl release of Dancing Killer, the up-and-coming Finnish electronic music producer and artist recently released the incredibly creepy, stop animation based video for “Under the Killer Moon,” by Tommi Niukkanen. As far as the single, it’s a retro-futuristic and broodingly cinematic track featuring layers of shimmering, arpeggiated synths and thumping beats — and while clearly being indebted to the aforementioned John Carpenter and Umberto, it may also be the most menacing track of the entire album. NightStop is the attention grabbing brainchild of its Jyväskylä, Finland-born and-based mastermind, the up-and-coming Finnish electronic music producer and artist Ere Ek, who started the 80s cyberpunk soundtrack-inspired project in 2012. And since then, Ek has seen a growing profile across Europe and Russia’s tight-knit DIY scene, steadily touring and releasing both cassette and vinyl releases. Interesting Chicago, IL-based label No Trend Records, the label home of Ganser, Absolutely Not and others, recently announced that they will be releasing a vinyl edition of NightStop’s most recent effort, Dancing Killer on March 30, 2018.